Do you want to put time on your side and make sales on autopilot? Do you want to make more sales next week than this week and see that trend continue to rise? If you answered yes, it is vital to use leverage to your advantage. We must all seek to do the work once and profit from that work many times. 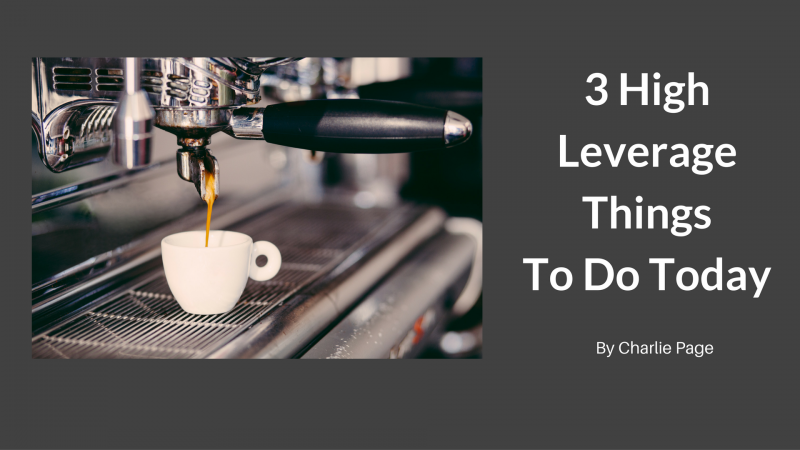 Here are three high leverage things you can do today to make increased sales a reality in your life. I hope you enjoy it. Please do share or leave a comment. Another good video training, Charlie. You treat this business like a business. A lot of people talk about squeeze pages and lead magnets, but you show us how to use them strategically – to create leverage, which allows for rapid growth; and to create automation, which allows for time freedom. You think like an entrepreneur. I suspect that’s a big part of why you’ve been around for 15 years! Oh, and I love the bonus tips. They are golden! Thanks Gordon! I’m looking forward to connecting again this week. Charlie … I don’t know ANYONE who gives more VALUE than you! This video packs a “Wallop” in terms of Information & Instruction. I’m going to start implementing ASAP. Thanks so much. Shalom!